The residents claim that they got ration cards only after the TRS came to power. Located in Hyderabad’s outskirts, the road leading to Jawaharnagar is busy with heavy trucks carrying garbage. The entire city’s waste is recycled at Jawaharnagar, emanating a foul smell that causes nausea. However, bearing the stench and enduring other ills like unavailability of water, poor sanitation and no roads, are the residents of Shanti Nagar Colony in Jawaharnagar near the dump yard. 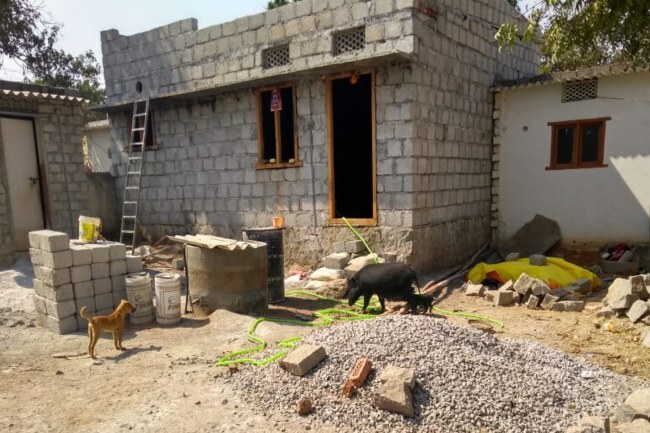 In the past few days, Shanti Nagar Colony, which has a population of close to 1,500 dominated by migrant Tamil labourers from the districts of Madurai, Coimbatore and Erode, has been witnessing several changes. The residents’ longstanding demand of a streetlight has been met, even drinking water has been provided, all thanks to the Assembly elections. While the electric poles have been erected, the wiring is still pending. Shanti Nagar Colony is a slum that came up more than 40 years ago near the dump yard, which was previously an abandoned place with wild trees and bushes, as the occupants couldn’t afford the rents in the city. The colony, which remains neglected by politicians otherwise, falls under the Malkajgiri constituency. Even the residents are unsure which constituency they fall under or who their legislator is, because no MLA has ever visited their colony. 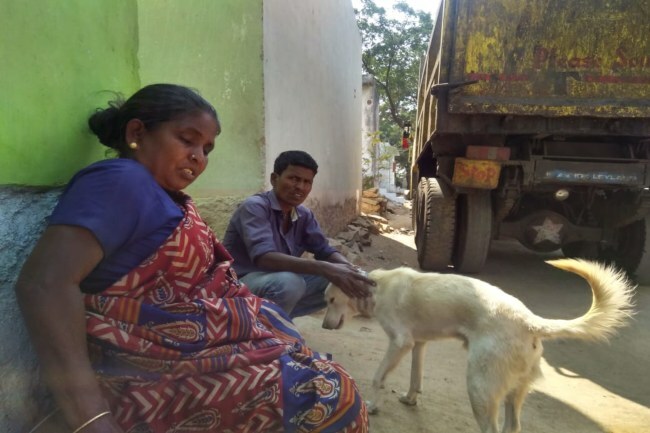 “We know only our local leaders and ward members, only they visit our colony whenever we complain about an issue,” says Kalavathi, a resident. Stray dogs and pigs stroll about in the colony because of the open drains and unavailability of toilet in each household. The locals say they are not aware of the free toilet scheme under Swacchh Bharat. According to the residents, they didn’t have drinking water supply for several decades, forcing them to pay for private water tankers. However, just 3 months ago, the colony was provided water supply. “We never had water supply, but just a few days back they laid the pipes, though the water supply is irregular. Anticipating the worst, we just have to fill water in all the vessels, because there have been times when the water didn’t come for a week,” laments Mariamma. Mariamma, a native of Madurai in Tamil Nadu, says that she’s been staying in Shanti Nagar for nearly 50 years. However, the development in the colony has been very minimal. “There is no drainage system here, the sewage flows on the road, which invites pigs and mosquitoes, causing diseases like malaria and dengue,” she says. 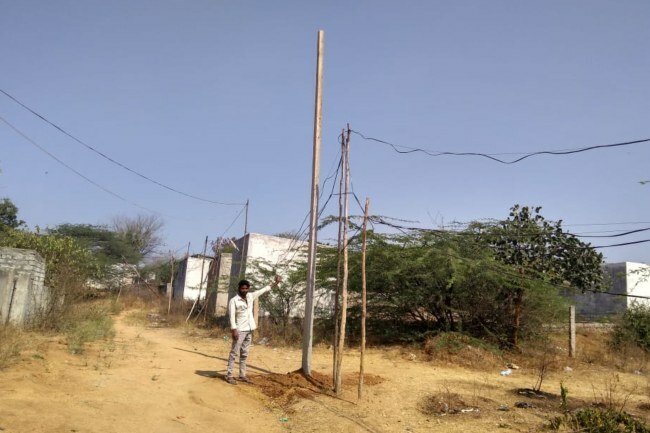 “We have been appealing for streetlights for several years, only a few days ago they erected poles,” says Mariamma. Though the colony lacks basic facilities, the residents are hopeful about the ruling TRS party which has performed better than the previous governments. “In all these years, we didn’t have water, but now we have supply. I’m also getting pension of Rs 1,000, and also rice and sugar from the PDS shop,” says another resident Maniamma. Maniamma claims that she and others will vote for the TRS, because only after it came to power they got their ration cards. “These people are doing at least something,” says Kalavathi.